My Real Estate Industry Journey – A 31+ Year Career Looking Back and with No Regrets. Reminiscing back on more than 30+ years of serving the real estate industry, consumers, real estate professionals and corporations within the real estate space, I consider it a true honor and blessing to have served. This is a great time in my life to reflect my thoughts while sharing my story in the process. In 1985 I had the opportunity (by accident) to get into the real estate industry. I come from a family that goes back 3 generations in title and escrow. I entered in first as a customer service rep at a local Title company, First American Corporation tasked with title searches, customer service, marketing, branch management (3 offices: Antioch, Walnut Creek and Benicia CA) and finally my role as Director of Executive Services for the Bay Area. 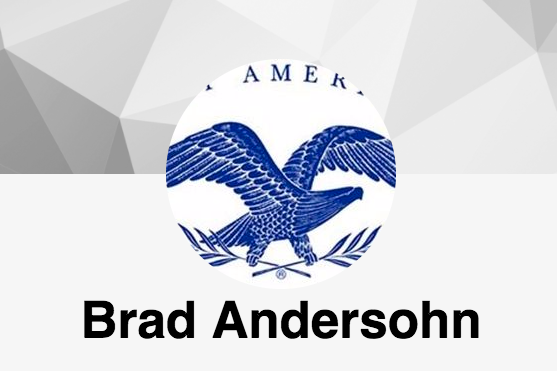 In 2006 when the real estate market started tanking from all the subprime lending that consumed the U.S., I became a free agent since I was let go along with many other long term employees and tenured staff. This was a real “turning point” in my career. Joining my first startup company allowed me the opportunity to see what I could do using education to help other learn and grow and then be blessed to witness and see others through to success. I joined ActiveRain as the community manager to help grow the site membership by providing education and training around the power of SEO and Blogging. As the Founder of ActiveRain University, I used the internet and the online platform to help grow a nearly 1/4 of a million member community. Market Leader was the first to acquire ActiveRain followed by Trulia which was then purchased by Zillow. 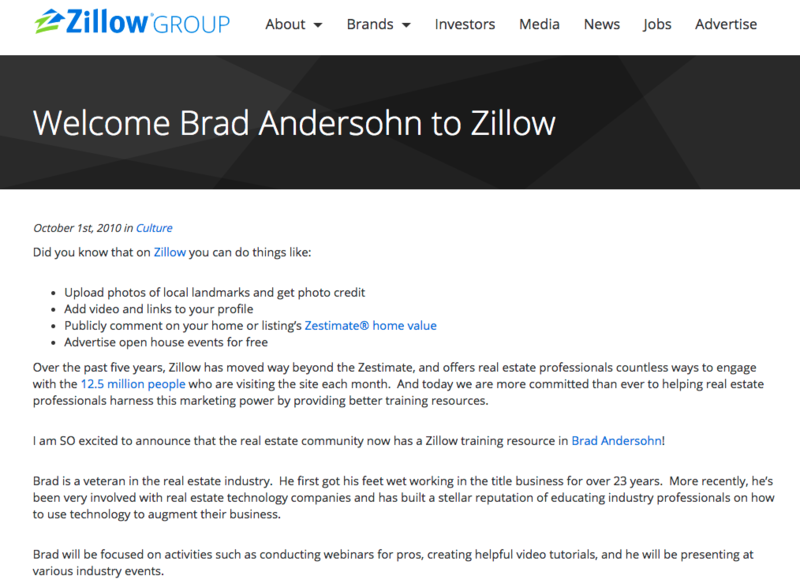 Zillow Group has since sold ActiveRain back to Ben Kinney from Keller Williams. In 2009, I wrote this post about another startup that decided to take their agents and be the first to move into the cloud. Back then, many other models and brokerages were losing money, shutting down or filing bankruptcy. The cloud was a unique and alternate way to keep business alive and thriving with less or no overhead and reduced operating costs. 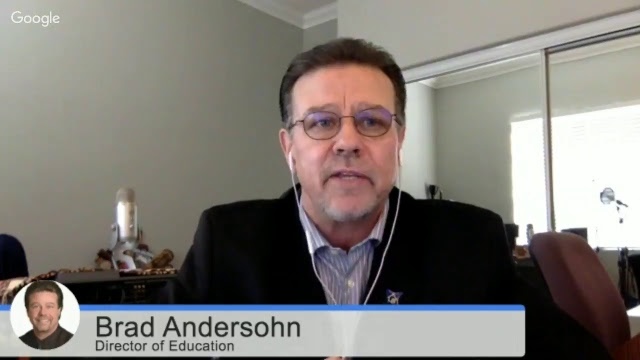 Today, eXp Realty is one of the most disruptive models in the industry. Back then, I remember how excited I got and how impressed I was with the company and leadership, you could even say I was blown away by the entire concept?!? The idea of a high-tech and high-touch environment using fully immersive 3D virtual style access was the most fascinating and exciting technology I’d seen in a long time! 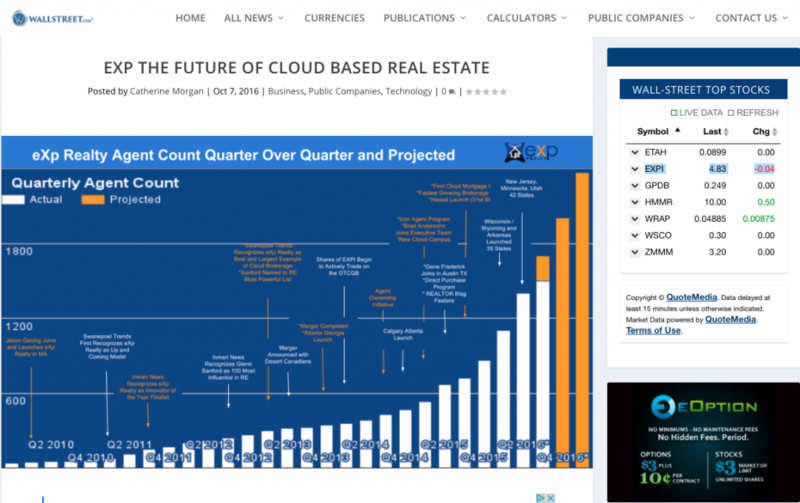 I continued following and stayed connected to Glenn and eXp Realty – See Company update and Cloud Tour. I Left ActiveRain and moved to Zillow. While at Zillow, I created and founded Zillow Academy, and once again provided a platform for agents, brokers and all real estate professionals to come together using high tech to draw and education to deliver. Interestingly, I always found myself returning back to eXp Realty, even while working for Zillow as the National Industry Outreach Manager. I was actually given a small corner of the eXp cloud space for my AR University and for the Zillow Academy. My career in the cloud had already unknowingly begun. There was just something really cool and special about this company and their platform in the cloud. This was affirmed and confirmed by my friend Stefan Swanepoel when he made this claim, “eXp Realty -The Amazon of Real Estate!” back in 2013. 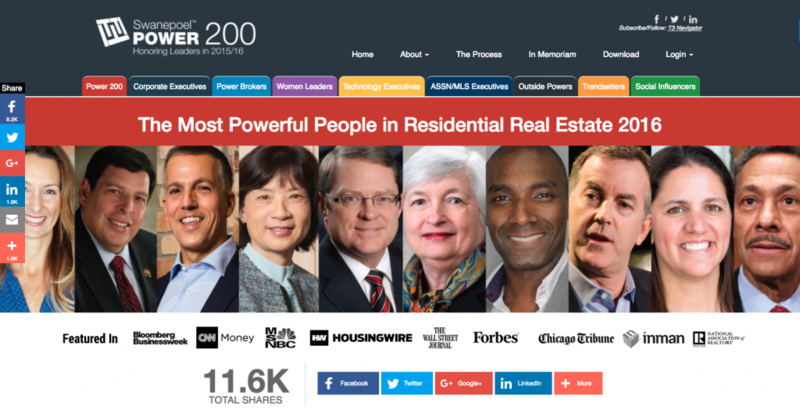 Later, he named Founder and CEO Glenn Sanford as one of the Top 200 Most Powerful in Real Estate in his coveted annual report known as the Real Estate Trends Report. The National Association of REALTORS® featured eXp Realty and Glenn Sanford in their Realtor Magazine as “The Virtual Edge!” in the real estate industry. 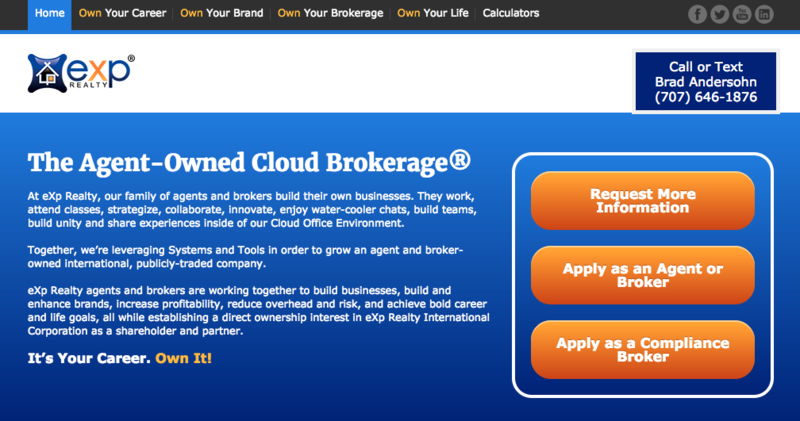 Yahoo finance announced the move, then this Inman News Article came out and the next thing I know (7 years later) I find myself with yet a 3rd startup company here at eXp Realty. This is where my dream of an online global education center was created and came to fruition. It is still being built with many great iterations to come. The RETechCampus – a global conduit to connect real estate pros from around the world. Many industry friends and associates wondered why eXp Realty? 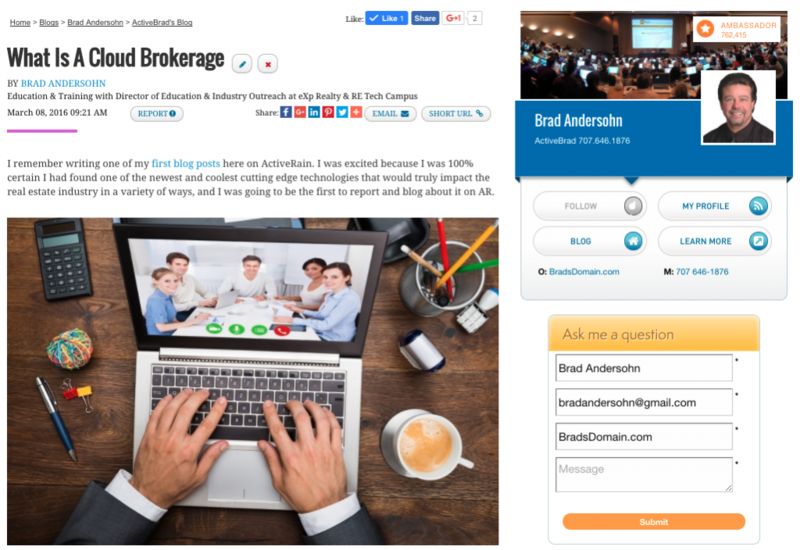 Literally thousands of agents and brokers around the country have been asking “what is a cloud brokerage” so here’s another blog post article. This one came with an invite to a Google Hangout. In closing, I woke up this past Saturday, Oct 29th, 2016 to see that our my company had been selected as a top stock on the Wall-Street. This is just one of the unexpected perks and grand finale’s for my career. 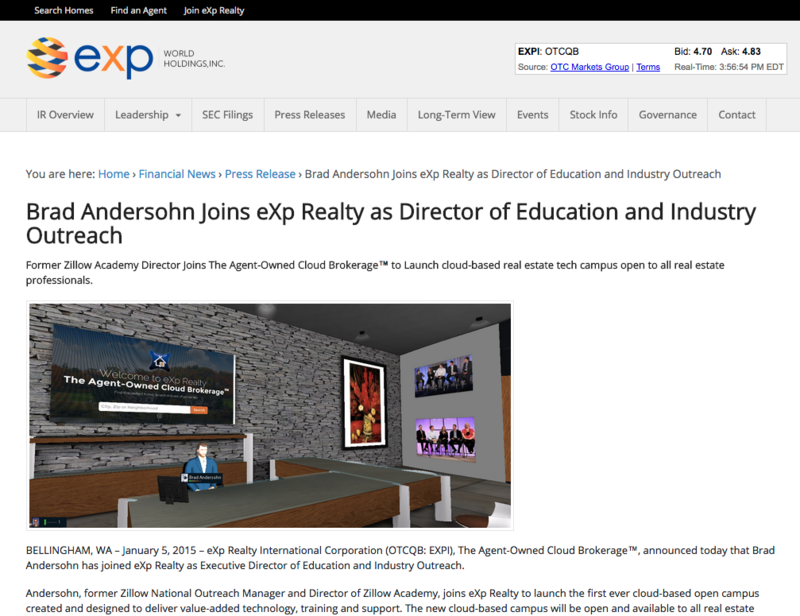 I knew eXp Realty was special and today is no exception. I pinch myself everyday and truly look forward to sharing the rest of my story as it unfolds but until then, let me share with you why eXp Realty for myself and for so many others? Every agent and broker in America and around the world needs to see this model. It is the only agent owned cloud brokerage in the industry and we will be coming to your market, it’s only a matter of time now. Let me show you why myself and so many other top agents and brokers are joining eXp Realty today and why it will continue going forward? It may be the very best hour of education and due diligence ever spent in your life. It’s your business, it’s your career, and it’s your clients and life. Do you really know what we have? Do you understand this new mobile global concept? You should and I have no doubt that eventually you will.